Syria got hit first. Now, the US readies a preemptive strike against North Korea. The sudden shift in foreign policy – a reversal from campaign pledges to hawkish moves – came as a surprise for many Trump supporters. And it's caused relations with Russia to hit their lowest point yet. Despite America’s top diplomat traveling to Moscow for talks, it seems more differences than common ground were established. So what drives Trump’s ambition overseas? And is the new administration simply following in Obama’s footsteps? We ask three-time US presidential candidate and former Congressman Ron Paul on SophieCo. Sophie Shevardnadze: I am joined by a veteran American politician, three-time presidential hopeful, Dr. Ron Paul, welcome to the program, great to have you back with us once again. So, The decision to strike the Syrian airbase was sudden, with the administration stating previously it wants to stay out of the civil war. Does Donald Trump really have a foreign policy strategy he’s sticking to? Or is he acting on a whim? Ron Paul: I think it’s changing all the time. We’ve been trying to figure it out, we’re very interested in it, and he talked a lot about foreign policy and libertarian group that I represent tended to agree, we were pleased that he wanted to have a better relationship with Russia and we were a bit disappointed when all of a sudden it changed and, as a matter of fact, we’ve been scratching our heads right now, trying to figure out exactly what has precipitated this change, because, obviously, it is different, and it’s significant and we don’t know exactly what that means but, hopefully, we can still have better relationships with Russia as he intended during the campaign. SS: What happened, though? Do you think Trump was pressured to act by more hawkish voices in the establishment or was it a personal decision? Is Trump making these dangerous decisions on his own? RP:Well, see, I don’t think anybody has this figured out, because it’s back and forth, it changes a whole lot. I don’t think he comes from a firm set of principles - neocons, we know exactly where they’re coming from and what they want, they’re in a way predictable. The libertarians, like myself, we’re very predictable, because we think the least military confrontation, the better, we want to deal with the world and trade with everybody we can, and be open - but I don’t think Trump adheres to that. I think he even admits that he doesn’t have a rigid policy, but, still, it doesn’t explain the sudden shift, you know, because he had some people in his administration that were sympathetic to his views, that they would be more open and friendly with Russia, and all of a sudden it changed, but, then again, there are few in his administration who hold exactly the opposite view. There were some neocons appointed to the administration, and their position, unfortunately, is being heard, and I think that the neoconservatives got a great deal of influence in the administration, so we don’t know exactly what will come out of this, but those of us who would like to see non-confrontation, we’re a bit concerned about it. SS: Rex Tillerson paid a visit to Moscow, representing the Western stance on Syria - but can that message even be united and clear, if Tillerson himself changes his mind week to week? RP: I think that is true, and we wonder who actually has the greatest amount of influence. I know these organisations that represent certain viewpoints and are frequently mentioned in those groups that might have influence on our foreign policy, and they represent our military-industrial complex, and unfortunately, history has shown that people take advantage of conflicts and wars, because there’s war profiteering - sometimes it’s not intended to create war, but just a sense of war and conflict to make an excuse to build more and more weapons, and that may have a big influence, because the industries are represented in governments, but this is something that has been known throughout history, that there’s an incentive to have antagonism because it serves interests of special groups. SS: As you’re saying, the motivation behind the attack is propping up the military industrial complex - what’s firing 59 missiles going to do for the U.S. defence industry? Do you think a bigger attack is being planned now? RP: When you shoot off 50 Tomahawks they have to be replaced and maybe more, and they’re going to cost more than ones that you’ve just recently shot, and that was, to me, a demonstration of a changed attitude - not so much to kill a lot of people, I don’t think it was intended to do that at all, but it was supposed to be sending a message that Trump has a different opinion now about Assad. Before it was quite a bit different..
SS: Is the U.S. preparing an all-out intervention in Syria using a weapons of mass destruction pretext - just like it did in 2003 in Iraq? RP: Let’s hope not, it’s hard to judge that, and like I’ve said, I don’t think Trump has a precise position in it. it changes depending on which advisor he might have talked to recently. Let’s hope it’s not being prepared like Iraq, but the distortion of the information that they deal with is a big concern and my main my goal, with my organisation with my website is to just get to the truth, to the bottom of this, and with always a goal of less confrontation. Right now, it is really a challenge to figure out what’s going on. So, I think that it’s a serious problem. SS: So, there's still no solid evidence, but the blame for the chemical 'attack' is being pinned on Assad. The U.S. envoy to the UN Nikki Haley said that the proof is "naturally classified", the same thing we heard when it came to Russia's meddling in the U.S. election. Is this an established tactic now - to talk about classified information, and not reveal anything…? RP: I think, sometimes, you could look at the incident and dealing with poison gases is more or less an excuse, not a good reason, that’s an excuse to shift policy to satisfy some special interests and, of course, the war propaganda tends to be mostly lies, which is historical, and there were a lot of lies told - I was in the Congress at the time - about going into Iraq, which I strongly opposed, but there was all this story about the great danger, Saddam Hussein was about to bomb American cities and he has weapons of mass destruction...So, it is extreme exaggerations and I think the question is - why go so fast? If there’s a question, let’s sort it out, let’s find out what really happened - was there really some gas there, how did that happen and who was holding this gas, and it just doesn’t make any sense to me that Assad would be involved… It doesn’t serve his interests. Whoever did this, placed a perfect false flag for change in our foreign policy, and now, I think, there should be an investigation by our government, our politicians to find out the truth of things, rather than just accepting hearsay about who did what, and that’s our biggest job that we have to deal with here. SS: Eric Trump, the President’s son, said that the airstrike on Syria proves his dad has no ties to Russia. Could it all really have been about that - Trump bombing Syria to prove to the audience at home that he is not a Russian puppet? RP: It’s a possibility, but it’s conjecture, but it would make sense if you don’t have a firm policy and you can go back and forth and he’s getting hit politically - it’s looks like the pro-war people in this country have the control of the propaganda machine, and he might have felt like he was not in charge as much and had to change his position, so what Eric is saying, maybe there’s some truth, because now they didn’t purposely go out and shoot down a Russian plane or kill anybody - they went out of their way to warn Russia what he was doing and the missiles were just symbolic and it could be a political symbol, which is done a lot of time, or it could be something more involved,but there’s no way for me to know that. SS: The alt-right movement that was so excited about Trump when he ran for office is not at all excited about the Syrian strikes – figures like conservative commentator Ann Coulter are voicing their disappointment. Why is Trump going against his power base? RP: I guess he’s the only one who could answer that, it doesn’t seem to make a lot of sense, but if you don’t have firm convictions, you can say “I have their support and they’re going to stick with me”... What happens so often in elections is they will go to their base, the ones who are most determined and they win primaries and then they shift gears to a more moderate, modest position, maybe internationalist, maybe they have been non-internationalist- you know, in the primaries. But in this case, maybe he’s a little bit late for doing that and some of them are offended. I think it’s a healthy challenge here, in America, when conservatives who had supported him and had hopes for him, even some libertarians had hopes that we would have a change in foreign policy… but a lot of people are waking up and saying - “You know, it looks like more of the same”. SS: You know, President has declared this kind of war with the media ever since his inauguration, but after he ordered the attack on Syria, there has been nothing but praise for him in the press - why does the American president have to launch an attack on a foreign state to raise his approval rating? This is crazy. RP: That shows you that neoconservatives have a powerful influence, and I think average people - I have determined with my experience in politics - average people don’t like war, but the war drums have to be beaten in order to excite people. It really doesn’t make any sense, but the war propaganda is controlled by governments, as is tradition, and the media and they have a lot of reasons for that - everything from religious reasons to monetary reasons, to military-industrial complex, and all of these things. It is amazing how much influence they have, but I really don’t think they represent the people. I still talk to our campus people, the young people, and the people I talk to, at least, they don’t want this, they don’t need confrontation, and it’s almost seems like… it makes no sense whatsoever! I think they might do this for reasons - “it’s token, it’s not a big deal, we’re not declaring war on anybody”, but the big problem is that sometimes accidents happen, there are unintended consequences and you can’t always predict what the opposition is going to do and that’s why I think it’s so dangerous. SS: Many hoped Trump’s ‘America first’ policy would mean a step away from America’s overseas military interventions, instead he’s increasing drone strikes, campaigns in Syria and Iraq - what happened to his campaign promise? Why is he not able to reduce U.S. military involvement in the world, like he said he would? RP: I don’t think anybody knows that other than himself. We have to realize that he’s just adapted to the continuation of the policy that Obama was doing. It’s been going on for a long time, it was Obama who said “Assad has to go”, so now we’re back to not quite that far. It looks like, maybe, his position… - because the day after missiles flew, he was saying something like “we’ve gotta get along” - so the ambivalence is such that nobody can say exactly what the policy is and I don’t think ambivalence is a good idea. I think people should speak clearly, and that’s one thing we libertarians do, we speak very clearly on what we think how we should treat other people in the world, but, I think that this shifting back and forth leaves too many questions to ask and trying to please both sides, both the people who say “be freinds and trade and have no problems” versus people who say “we can’t be resting until we get rid of Assad” and, unfortunately there’s a lot of that talk. That’s been going on for decades, actually, and we were hoping it would stop. SS: You have a point there. At first Trump was sceptical about regime change, now there’s talk about removing Assad - but what do you think, does the administration really have an idea about what to do with Syria - if Assad goes? RP: They are planners, and they have strategic plans and it’s hard for someone like myself deciding a good plan versus a less good or a bad plan, because we want to stay out of planning things for other people. So, maybe the oil pipeline is a big deal, big deal for our allies and some of our people in the Persian Gulf and a big deal for Russia, where this pipeline going to go - is it going to go through Syria, that can be a big deal. But from my viewpoint, I would say, let somebody else worry about it and we can worry about having a healthy economy and showing the people what it’s like to live in a free society - that’s what I would concentrate on, but I think there’s this whole idea about the many things that go on, and people can be convinced and also the political desire to please different faction, and when you do that, you usually don’t please either side. Both sides get annoyed with you if you try to please both factions in a debate. SS: In his recent interview to ABC news, Tillerson talked about the chaotic situation in Libya, caused by violent regime change - if he is aware of the consequences of regime change, does that mean he just doesn’t care about what happens to Syria after toppling Assad? RP: It’s no way for me to know exactly what’s in his mind, his position seems to have shifted, but you know, it’s not unique to the current administration. By the time Obama was leaving office, he wasn’t taking the position that Assad has to go, he softened his position because he knew it wasn’t going to happen and he was going to leave it for somebody else. So I don’t think I can… I try to sort it out and I try to influence our foreign policy in a way I’d like to see it go, but I can’t look into their minds and what they’re really thinking about, because, like I’ve said earlier, there’s a lot of ambivalence about what might be going on in these people’s minds - there’s lot of different special interests and how fast and how far you have to go… It’s so much easier for us who believe in non-interventionism and minding our business, and not maintaining an empire - that’s simple, and I believe it’s the right thing to do. When we get into intervention management, it’s sort of like managing economy - nobody can manage the economy, only the people can do that. Same way on foreign policy. SS: I’m gonna ask you this question and I just want your assessment of what we have in the finish line. The U.S. is helping in the struggle against ISIS in Iraq’s Mosul, and in neighbouring Syria as well , but according to reports from the ground, the American attack on the Syrian government only paved the way for an ISIS offensive in the area - so does this mean the Administration is helping terrorist groups and if so, then they don’t care about it? RP: Or they’re not very smart. You know, maybe they don’t understand it and there’s a bit of that that goes on, you know, one of the rationals about how we got into that mess in the Middle East was that we really, our government didn’t understand the players over there and didn’t understand the issues. That may be part of it, but I think that happens to be true that this did help the rebels. It’s known, it’s been in the papers, that we have allied ourselves with the “moderate” rebels, and for some of our American politicians, whenever they say there are ‘no moderates’ in Syria, but we use them, because the American people don’t want to see body bags coming back, so they use troops that might go over and say, “we’ll help one of those radicals and they’re going to destroy Assad”. This was more or less the rationale for us helping people to deal with the Soviets. When they were in Afghanistan, we helped radicalise some of the islamists to fight our battles for us, and I think that’s part of the story too. SS: In that interview to ABC news Rex Tillerson explained Russia’s support for Assad is either down to Moscow’s incompetence or the fact that it has been out-manoeuvred by the Syrians. How can you negotiate and defuse the situation if you consider your partners incompetent, can you really go anywhere from there? RP: This is a tactical thing for a lot of people, where you do this, you don’t do this, you move around - so to me it’s dealing with a problem which can’t be solved, it’s sort of like… when we talk about the monetary policy - where’s the right interest rate? Well, for me, it’s the free market, but they take it over and “raise a little higher, a little lower”, and… tactical things don’t work for me. I want strategic things. I want to know what we stand for - we stand for freedom, we stand for non-intervention, we stand for free markets, we stand for non-interventionist foreign policy, and not antagonising, and we stand for free trade. So, sometimes we hear words like that, sometimes not - whichever serves their purpose at that particular moment. SS: At the G7 summit, there has been no unity among the Western countries on Russia and Syria. Despite support for the U.S. missile attack, the UK’s idea to impose new sanctions on Russia over its support for Assad was not welcomed by everyone. Does this mean Europe is not ready for any kind of tough response? RP: Let’s hope so. I don’t see how it serves any purpose, unless people behind the scenes want it for some sort of sinister selfish purpose and they have to convince the people that they either out of fear have to go along with the policy or out of sense of a so-called patriotism, something like that. So, there’s a lot of reasons behind the scenes, which are the real reasons, then you have to have the people who use the propaganda and, usually, patriotism is one of the things that they appeal to. I was always accused in Washington, when I wouldn’t vote for funding of these programs, that I was not a “true American”, I was “not supporting America” and “don’t support the troops”. But I didn’t feel that lonely when I talked to young people or people in the tax affairs - there’s a lot of people who agree with me. Now, we shouldn’t be doing this, but then again, there’s a lot of people who agree with this more militant approach, because they like to be strong, they don’t want to be pushed around - so, it’s a challenge on propaganda. SS: During that meeting, the G7 meetings Rex Tillerson left European diplomats puzzled with one remark, asking - quote - “Why should U.S. taxpayers care about Ukraine?” What do you think, is there an answer to that question? RP: They should care if we’re wasting taxpayer’s money to have regime change, and take one leader out and put another in - they should care about it, because it’s a tax cost and it’s also a cost on what does it do with relationships. So, yes, that’s very serious… But many people, you know, seem to be convinced that spending more money on military is always okay. Conservatives who are supposed to be saving money would never save a nickel when it comes military spending, and that to me is sad, because they’re inconsistent about them being fiscal conservatives. SS: Generally speaking, this foreign policy approach - using force - seems to be favoured on both sides of the political establishment in the U.S., with Republicans and Democrats alike coming across as hawkish - why is there no room for a conciliatory approach in U.S. politics anymore? RP: Well, there was, and that’s why I helped Donald Trump become President, so the question is not that they are not there, it’s … once again, the policy shifted, after the fact, because the grassroots were mobilized with that and they would like to see that, and I think that is very good. But once again, they’re expressing some disappointment here, and we don’t know what’s the final conclusion is. Maybe this was just a demonstration rather than a total change in foreign policy. SS: Alright. Thank you very much for this interesting insight. 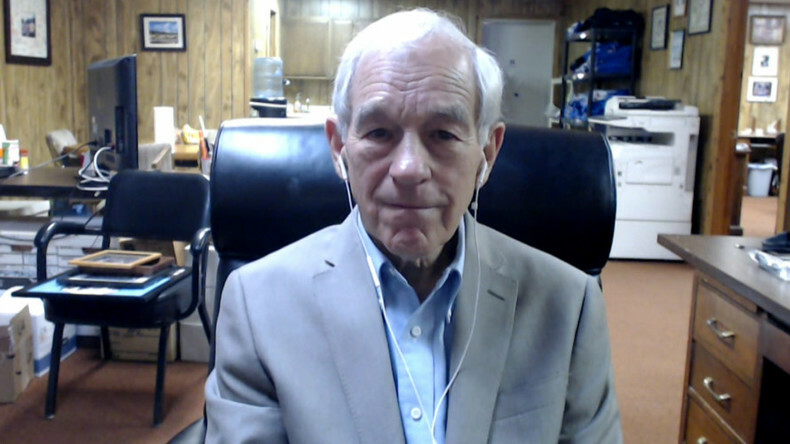 We were talking to Dr. Ron Paul, long-time Congressman, U.S. political icon, and we’ve been discussing the latest developments in the U.S.-Russia relations, the surprising turns in Trump administration’s policies and Washington’s engagement in the Syrian conflict. That’s it for this edition of SophieCo, we will see you next time.